This microscope is a Cuff-style compound microscope on a large wooden base. It is supported by a pair of brass pillars, one of which slides relative to the other when the instrument is focused. The cruciform stage is fixed to the stationary pillar, which itself is supported by a scroll support piece. Pressed into a large opening in the stage is a specimen spring stage. It has a pair of leaf springs instead of the usual helical spring. The stage also has a holder for a forceps, which is included with this instrument. This microscope has a gimbaled concave mirror mounted along the optic axis in the brass base. The microscope body is made entirely of wood (possibly Lignum vitae or palissander, a common material in France or England in 18th century). It consists of two sections: the objective nosepiece and an upper body tube. The upper tube is wrapped in black shagreen. Optics are the typical three-lens system of the 18th Century: objective, field lens and eyepiece. All three are single, bi-convex lenses. There are two objectives with this instrument. They consist of a Lignum vitae base and a brass collar that holds the single lens in place. Imaging is quite good considering the simplicity of its optics. The total magnification is approximately 100x (for the low power lens) and 150x (for the high-power lens). 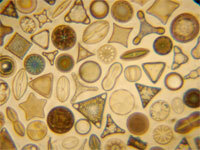 At high magnification a considerable amount of chromatic aberration can be seen. The large wooden base (24x24x7cm) is made of mahogany. It has a single drawer, the face of which covers the full front face of the base. The drawer holds the accessories. The total height of the instrument, including base, is approximately 41cm. There are two serial numbers associated with this instrument: "551" on the microscope itself, and "495" stamped on the condenser base. In addition, the letters "VG" are written in chalk on two inner walls of the base. 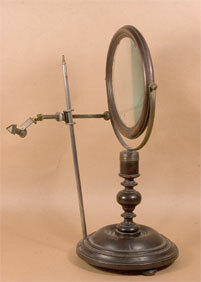 Supplied with this microscope is a separate condenser lens on a circular wooden stand. We can use this device, and an oil lamp in the Golub Collection, to demonstrate two possible configurations for illuminating a sample. 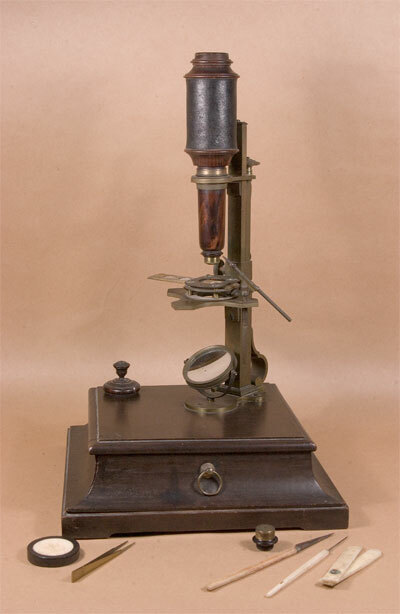 While the country of origin is unknown, there are clues to its origin: the highly sculptured dust cap, the all-wood construction of the microscope body, the black shagreen covering suggest that the microscope (and condenser) were manufactured in France. The date of manufacture is estimated to be 17601780. Many thanks to Alberto Lualdi, Professor of History of Science for his helpful discussions regarding the origin and makeup of this microscope.